One of the most powerful tools in a contact center’s arsenal is the dialer. Not necessarily the dialer itself – that is just one component. But a high-quality dialer deeply integrated in surrounding systems is the shortest route to a lot of sales acceleration activity. Increasing the quantity of outbound calls is often one of the key steps. All it takes is a little set-up, and some creative thinking around automation. This is the first of a series of posts where I will outline some great ways that we see our customers using automation, integration and dialing to achieve great things. Automation of any kind reduces the time wasted by agents on manual tasks. 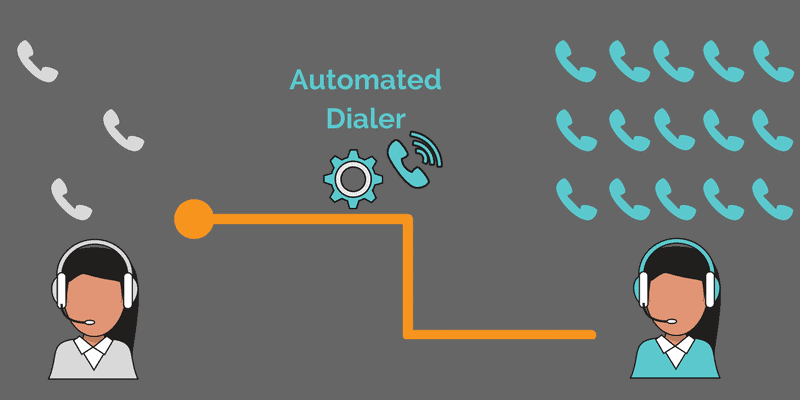 With a dialer, the key target for automation is, no surprise, the dialing. We urge any business that hasn’t looked closely at time spent on manual tasks to investigate; it can easily account for more resource than actual talk time. Obviously, the more time agents can spend talking to contacts, the more sales they are able to initiate and support. The second important aspect of how a predictive (or even adaptive) dialer drives sales acceleration is the real-time decisions it can make. Using algorithms to predict agent availability not only removes the need for agents to dial, but the need for them to wait for calls to be connected. Likewise, a good dialer can avoid busy lines or voicemail. A contact center that adopts a decent automated dialer can reasonably expect to more-than-double the number of contacts its agents make. And, because those contacts are based on all available data, they’re more likely to result in a positive outcome. But potentially even more important than the dialing itself is the integration into the entire sales process. Every project we’ve seen that tries to automate calling and other contact processes, also unearths all kinds of inefficient and costly workflows. These processes usually involve the way data informs contact decisions, and the enrichment of data from multiple sources. So if you haven’t automated contact processes, try it out, and you’ll find that you also end up tackling systemic pain points. The results can be transformative, if the sales acceleration is seen through to its conclusion. Are you automating everything around how your team contacts your customers? Over the coming weeks, I will be looking at many other ways to use a dialer together with integration and automation.